Innsbruck, capital of Austria’s western state of Tyrol, is a city in the Alps that’s long been a destination for winter sports. Innsbruck is also known for its Imperial and modern architecture. The Nordkette funicular, with futuristic stations designed by architect Zaha Hadid, climbs up to 2,256m from the city center for skiing in winter and hiking or mountaineering in warmer months. Coveted by empires and republics throughout its history, Innsbruck was the seat of the imperial court of Maximilian I by the end of the 15th century. Trams make getting around the city quick, efficient and cheap. Explore the Tyrolean capital’s history at Archduke Ferdinand II’s 10th-century Schloss Ambras, the Tyrolean Folk Art Museum, the grand 15th-century Imperial Palace and Maximilian I’s famous Golden Roof. 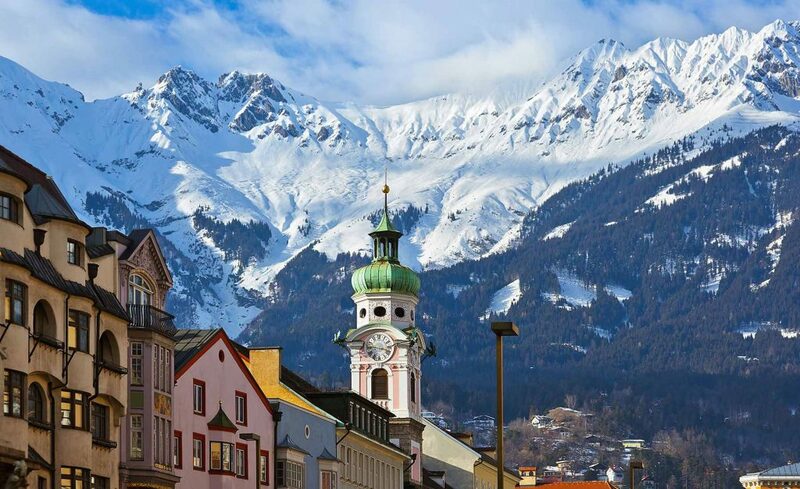 One of Europe’s most idyllic cities, Innsbruck will not disappoint. Innsbruck offers diverse cultural events, world-famous attractions, exciting city tours, great highlights in the center and surrounding mountains, genuine hospitality, modern lifestyle and sporting flair. Winter offers something for everyone in Innsbruck and the surrounding area: rosy cheeks from tobogganing fun with the whole family. Wonderful deep breaths on extensive cross-country ski trails, stunning views and picturesque winter scenery on snowy walks, snorting horses pulling historic sleighs along secluded trails and numerous indoor sports regardless of weather and snow conditions. These experiences all have one thing in common: they leave you with great memories of a holiday that rejuvenates body and soul.